(CNN) - After a more than two-month hiatus, former Alaska Gov. Sarah Palin is planning to crash the presidential party once again with a heartland-themed re-launch of her "One Nation" bus tour this week in Iowa, according to a Palin fundraising email obtained by CNN. Palin is bringing her Constitution-draped bus to the Iowa State Fair, just 30 miles south of where the Republican presidential field will take the stage on Thursday for a presidential debate in Ames. It's not yet clear which day the tour begins, but her surprise arrival in Iowa will happen before the closely watched Ames straw poll. Palin is not on the straw poll ballot. According to a video link included the fundraising solicitation for Palin's political action committee, Sarah PAC, it appears the bus will also take Palin to Missouri and Illinois to visit the respective hometowns of former presidents Harry Truman and Ronald Reagan. "The heartland is perfect territory for more of the One Nation Tour as we put forth efforts to revitalize the fundamental restoration of America by highlighting our nation's heart, history, and founding principles," Palin wrote in the email. Sarah PAC Treasurer Tim Crawford would not provide more the details about the tour. During the opening act of her bus tour in May, Palin toured historical sites along the East Coast, grabbing countless headlines along the way and stealing a share of the political spotlight from former Massachusetts Gov. Mitt Romney, who announced his presidential bid in New Hampshire at the same time her bus was driving into the state. Federal paperwork reveals that her political action committee shelled out nearly $20,000 on the tour this spring. The bus tour sequel adds even more drama to a blockbuster political week in Iowa, which holds the first contest in the presidential nomination fight. Along with the debate and the make-or-break straw poll, most of the Republican candidates are slated to deliver stump speeches this week at the Iowa State Fair on the Des Moines Register-sponsored political soapbox. And on Sunday, Texas Gov. Rick Perry, a Palin ally who is on the verge of joining the 2012 race, will make his Iowa debut at a Republican fundraising dinner in Waterloo. Palin's re-emergence in Iowa just hours before the debate is a reminder that the 2008 GOP vice presidential nominee intends to remain part of the presidential discussion as long as possible, despite being largely dismissed by party insiders. While polls show that Republicans harbor doubts about whether she should run for president, Palin would undoubtedly be a factor in the GOP primary thanks to her popularity among conservative activists and a knack for attracting media attention. A Gallup survey out Tuesday showed that Palin generates more enthusiasm among GOP voters than most of the candidates already in the race. And as Mississippi Gov. Haley Barbour recently put it, "she could raise enough money to burn a wet mule." Her advisers have long emphasized that such star power gives her the ability to delay a decision about joining the race until after Labor Day. Palin has pointed to September as a loose deadline for making a decision about whether she will seek the GOP presidential nomination. There is also anecdotal evidence that Palin has the potential to shake up the Republican race in Iowa. Despite having no formal campaign infrastructure in the state, hundreds of supporters turned out in June to catch a glimpse of Palin when a sympathetic film about her rise to power debuted in Pella. She has plans to return to the state over Labor Day weekend for a Tea Party rally in the Des Moines area. With any luck she tries to drive to Hawaii. 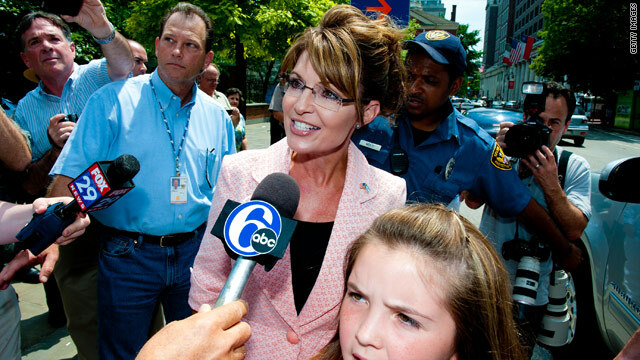 Blind allegiance to Sarah Palin : a memoir of our tumultuous years by Frank Bailey. A must read by her former chief of staff which exposes her petty, vindictive, and ignorant nature. This pseudo candidate is out of her depth in a parking lot puddle. She won’t show if it rains. I would love to be a fly on the wall in that bus. I love how the party of peace preaches so much hate. Has anyone noticed that CNN has yet to mention any reference to George Soros beating and choking his girlfriend. Is CNN in Soros' back pocket like our commander in teleprompter? Congrats Grandma, see that Track and his wife of 4 months just had a baby girl. Dodged another out of wedlock baby, good going. Maybe you should end the bus tour, go home and parent your children. At least instruct them on the proper usage of contraception, since the abstinenance lesson haven't taken hold. "Ibamaliar" you have to be kidding?!?!?!?! A debate between Obama and Palin would be a train wreck! Palin, a serious candidate, really?!?!?!?!?! The world is right, we ARE the most ignorant electorate on the planet! CNN....you really hate us don't you. What a disservice you do to your readers, mentioning this goofball's name. I love the two or three Palin supporters that add a comment here among the hundreds of normal people. It's so funny to see the dumbest of America speak up now and then. and obama makes the taxpayers pay for his bus tour,anyone can be pres. look what we have now. talk about worthless. Palin is not running. She knows its a hard job and she does not want a job. She wants fame. She will pulll out of the content with an announcement on TV in a few months, like her friend Donald Trump. I am sad that you are spoiling the Republican Party chances for elective victory. not sure what is worse Palin or Perry....Could the GOP field any more radical choices? What happened to people that are in the center? Getting really tired of people on the far right and left winning office. Restart the tour in Iowa and drive straight back to Alaska, please..... Bye-bye, Lip Stick. I have to believe that most of the voters have Palin figured out! As a person with a big mouth and nothing between her ears, I doubt that she would be any more electable than she was in 2008.